The Laguna de Guanaroca-Punta Gavilanes Protected Area and Refuge, located in this province, is one of the country’s wonders and a source of amazement for all who visit. A garden of biodiversity, the area harbors curiosities like the Annona havanenses, a plant species once believed to be extinct, but rediscovered here 25 years ago. The area’s dense vegetation creates a harmonious natural tangle that includes wild mamoncillo, mahogany, calabash, yellow mastic, buttonwood, brasilettia, oak, copperwood, among other many xeromorphic species – more than 70 – in this coastal forest. Also located here is the country’s best preserved mangrove. The Laguna de Guanaroca’s 3,038 hectares, including the keys Laberintos de los Naturales and Ocampo, plus several smaller islets within Jagua Bay, is considered the “womb” of the estuary, since this lacustrine lagoon is where a large number of fish species spawn. The area is inhabited by 190 bird species, seven mammals, three amphibians, nine reptiles, 600 marine mollusks – in addition to land and fresh water species – and 120 varieties of fish, crustaceans, and turtles. 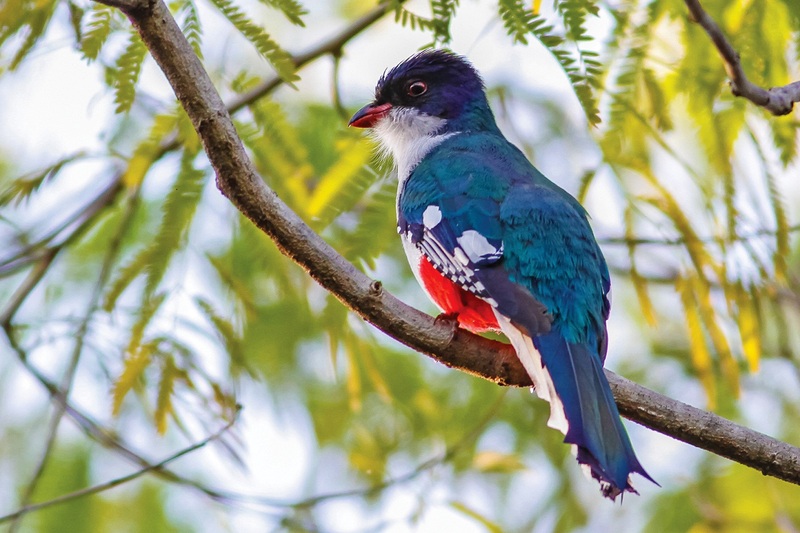 Living here alongside the national bird, the Cuban trogon, are todies, hummingbirds, cuckoos, mockingbirds, puffbirds, six types of warblers, doves, solivios, great kiskadees, ducks, egrets, pelicans, cormorants, gannets and gulls. 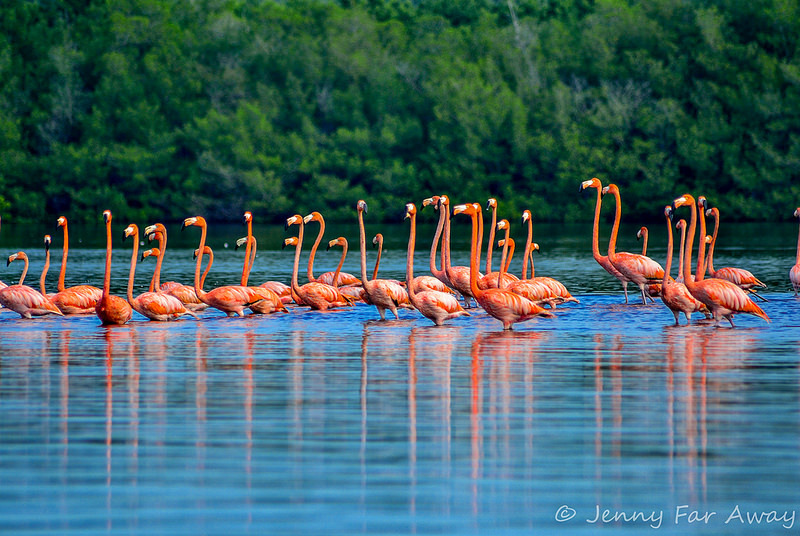 The year round presence of pink flamingos gives the landscape true splendor. They arrive from Florida, reproduce, and continue their migration toward the Máximo River or to keys on the northern coast, but while the adults leave, the young stay behind. 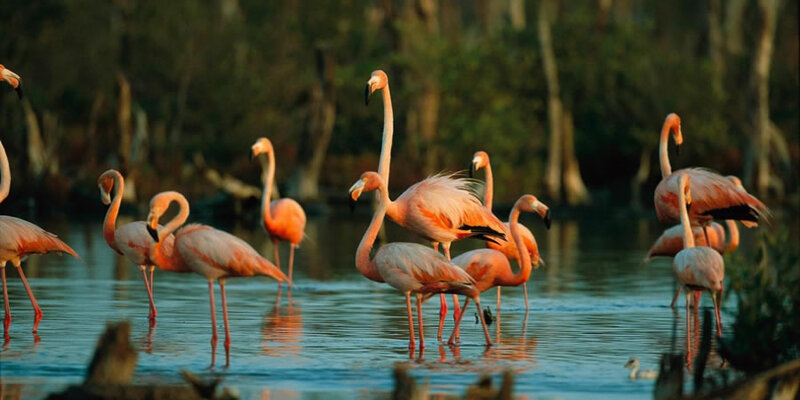 This is the place in Cuba where flamingos can be observed close-up, thanks to the silence reigning and the respect afforded the habitat, where more than a thousand pink flamingos can be seen together. La Laguna de Guanaroca – only 15 kilometers from the city of Cienfuegos – is included in the City Conservation Office’s program of walks, allowing residents to access the wetland from a point near Convento Hill, an indigenous archaeological site with links to the colonial period, where Fray Bartolomé de las Casas left his mark on the community of Jagua. Cuban and international visitors alike frequent the area, often on excursions scheduled weekly to the woods, or in kayaks through the estuary’s clear waters. All are captivated by the greenery and the water, with a view of the Guamuhaya Mountains in the distance. – The Laguna de Guanaroca-Punta Gavilanes Protected Area and Refuge, contains some 3,400 hectares of terrestrial and marine area (with the lagoon itself occupying 3,038, the crown jewel and main attraction), located in the municipalities of Cienfuegos and Cumanayagua. – The site is managed by the National Flora and Fauna Enterprise. – Guanaroca is a coastal lagoon into which a branch of the Arimao River flows, and is connected to Jagua Bay. – The name Guanaroca comes from the legend of a beautiful indigenous woman whose first child was killed in a fit of paternal jealousy. The mother’s grief was so great that her tears created the region’s rivers, Jagua Bay, and the lagoon. – Several pre-Colombian and colonial archeological sites have been identified in the area by local experts, and objects unearthed include stone tools, remains of food consumed by the island’s original inhabitants, and ceramics.